There are 32 planets beyond our solar system that may be able host life, according to the Habitable Exoplanets Catalog. The Catalog is put together by scientists at the Planetary Habitability Laboratory (PHL) , within the University of Puerto Rico at Arecibo. Planets orbiting stars other than our own are assessed by their potential to support life as we know it. What makes a planet potentially habitable? 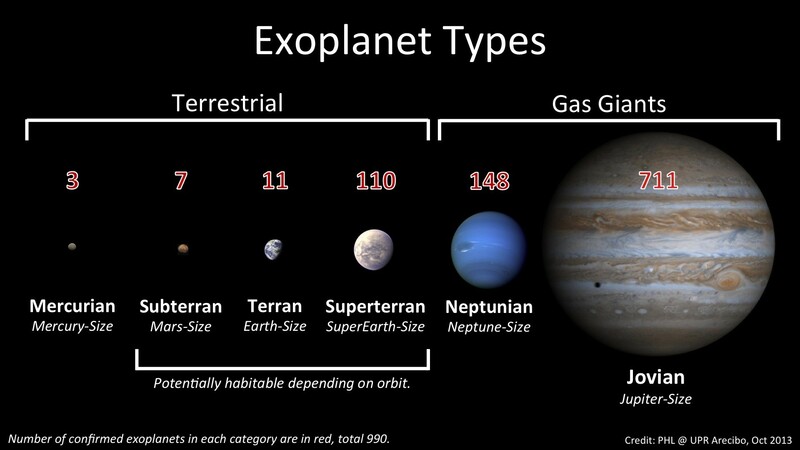 Potentially habitable exoplanets are planets which may be able to support any form of life. This could be anything from simple microorganisms to plants and animals. Of course, just because a planet has the potential to support life, it doesn’t mean alien life-forms are to be found there. Equally, based on current technology, we simply cannot assess many of the characteristics that would be necessary for life. The PHL scientists based their assessment on what can currently be measured. Firstly, a planet’s orbit. This is where the concept of habitable zones come in. These measure the distance of a planet from their parent star and consider the star’s luminosity and temperature, as well as factors such as the planet’s composition and potential atmosphere. Simply put, a planet cannot be too far away, or too close to a star as this would result in a planet being too cold or too hot to support life as we understand it. Secondly, size also plays a role, as explained in the following graphic. Only planets falling between the stature of "subterran" and "superterran" are considered potentially habitable. So which planets are potentially habitable? 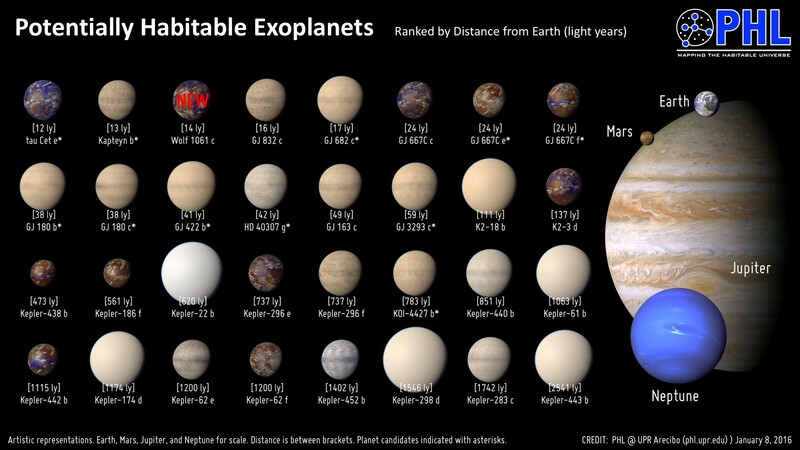 Based on these metrics and indicators, the PHL suggests that there are currently 32 potentially habitable exoplanets. As you can see from the following artistic representation of the planets, they are mostly bigger than earth. Of these, 21 are classified as Superterran – meaning their mass is between 5 and 10 times greater than Earth’s. The remaining 11 are similar in size to Earth (less than 5 time bigger), while, as of January 2016, none are classified as subterran. The chart lists them based on distance from earth, with the closest, tau Cet e, "just" 12 light-years away, while Kepler-443b is over 2,500 light-years distant. So there’s life out there? The lab highlights that in the next 10 to 20 years we could see the technology emerge that helps us determine if these planets could support life. Or even, indeed, confirm that they do. Asteroid mining: is this the next space race?